The Makah Public Transit System is available to everyone. Makah Transit connects with Clallam Transit three times daily on Monday thru Friday. Clallam Transit provides residents with links to Port Angeles, and Forks as well as connections to West Jefferson County via Jefferson Transit. 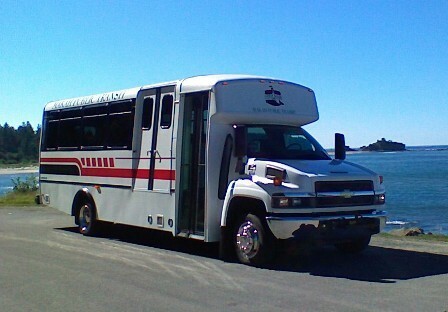 Makah Public Transit operates year round with the exception of Holidays and weekends. 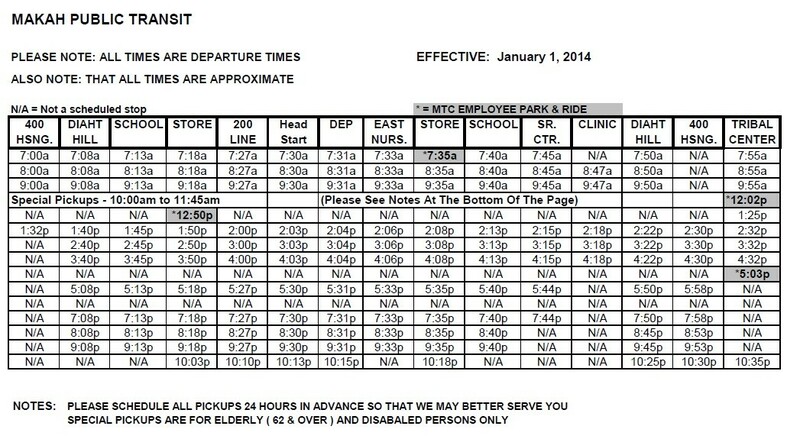 Makah Public Transit operates 5 days a week, 7:00 a.m. through 9:35 p.m. Makah Public Transit Schedule is designed to accommodate the Makah Tribe’s Employee Park and Ride, and has a 2-hour block for Special Pickups for the seniors, 62 and over and disabled persons. This Special Pickup service provides door-to-door service to meet the needs of our seniors and disabled passengers. Monthly and annual passes may be purchased from the Transit drivers or the support specialists in Building #150 at the Tribal Center on Resort Drive. Monthly passes are effective from the first day of the month that it was purchased to the last day of the same month. Annual Passes are effective for 365 consecutive days from the date it was purchased. All pets must be caged, with the exception of service animals. There is no transit service on Saturdays, Sundays or Holidays. Please note that Makah Public Transit serves a small, rural, close-knit community therefore, when there is a funeral, out of respect to the family, Transit service will be suspended from 1:00 p.m. to 3:20 p.m.